Candidates standing to be the next MP for North West Cambridgeshire were kept in check by the 14-year-old hosts of a school election hustings. Organisers Hani Mustafa and Thomas Cole led the debate at Hampton Vale Primary School yesterday (Thursday, April 30) with Hani, who chaired the hustings, preventing any personal attacks on fellow candidates. The most memorable line of the evening came from UKIP candidate Peter Reeve who declared polling in the constituency showed he was on course to topple the Conservative Shailesh Vara, despite him boasting a sizeable majority in the 2010 election. Mr Vara was empty-chaired at the hustings while the Peterborough candidate for the Green Party, Darren Bisby-Boyd, stood in for his party’s North West Cambridgeshire candidate Nicola Day. Mr Vara said he had a prior engagement and was unable to take part. 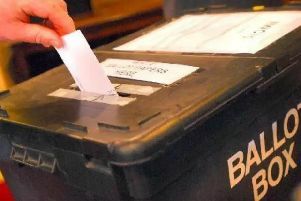 The other candidates taking part in the hustings were Labour’s Nick Thulbourn, the Liberal Democrat Nick Sandford and Christian Peoples Alliance representative Fay Belham. While the record of Mr Vara was attacked by some of the candidates, the audience of around 40 people delivered their biggest cheer of the evening for Mr Bisby-Boyd when he declared that government can always find money when it wants it, as shown by the decision to invade Iraq. Mr Thulbourn highlighted his committment to the constituency by saying he runs a business in Woodston. The opening question was on promoting mental health well-being in work organisations. Mr Thulbourn said this was one of the major failings in the city and Ms Belham said there was a crisis in the NHS. Mr Sandford said access to green space was important, but he was criticised by Mr Reeve for saying he was proud of the coalition’s record on mental health. The UKIP candidate also said he had been brought to tears by seeing how badly some people had been treated. Another key question was on how to improve education in the area. Mr Reeve said there was a major funding issue, Mr Sandford guaranteed there would be no cuts to school funding and Ms Belham said her party would look to reduce class sizes. Mr Thulbourn said the area was on the verge of chaos before adding that he knew of two or three people with children going to three different schools. Mr Bisby-Boyd said there needed to be a return to the system where local authorities are accountable for schools. Following the debate, Hampton College pupils Hani and Thomas gave their reaction to what they had heard.